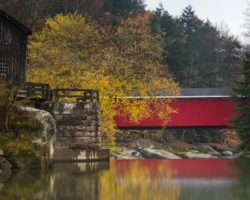 While it might not be as well-known as the historical significance of some cities, Pittsburgh’s role in the formation of the United States can’t be understated. 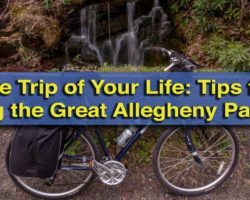 Almost as soon as the first European settlers discovered the three rivers area, the land here has played an important role in our country’s history. Today, this area is known as The Point, and is home to Point State Park. 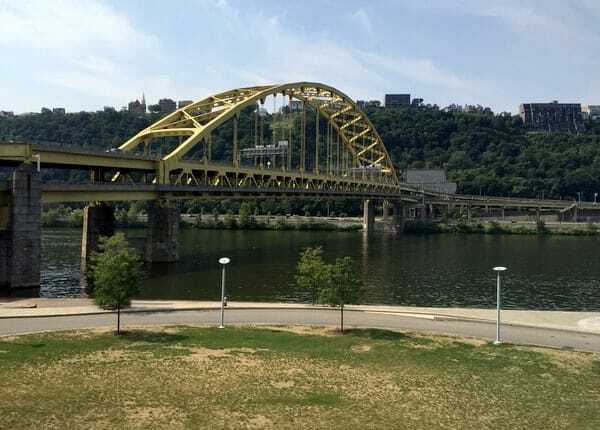 This park draws visitors exploring the beauty of the Monongahela River and the Allegheny River coming together to form the Ohio River. However, the park is not just a local hangout spot. 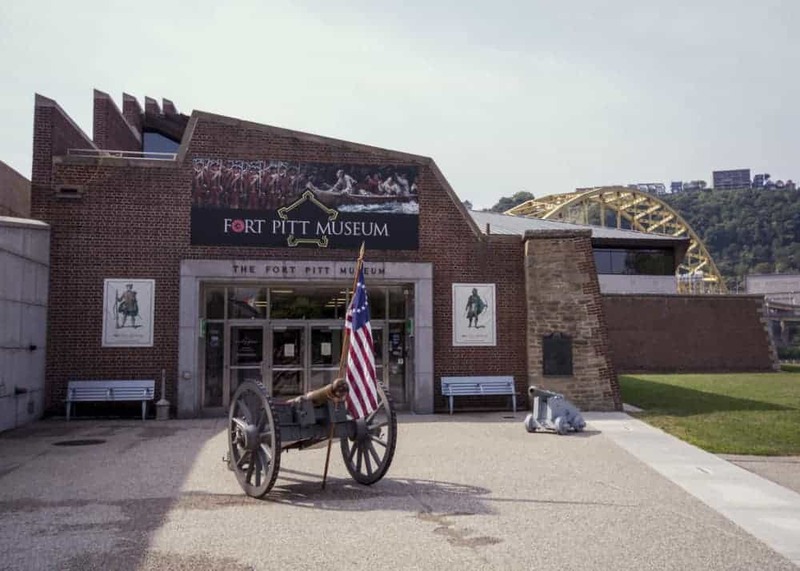 In addition to being the starting/ending point for the 150-mile Great Allegheny Passage, the park is also home to the fantastic Fort Pitt Museum. The Fort Pitt Museum is located in Pittsburgh’s Point State Park. The Fort Pitt Museum is housed in a recreation of one of the bastions of the English-built Fort Pitt. The outline of this historic fort can be seen throughout the park, and the museum’s location provides not only a unique historic antidote, but also offers the chance to better understand the fort’s size and shape. The museum first opened its doors in 1969 and is currently run by the Heinz History Center. There is a bit of overlap between the displays at the Fort Pitt Museum and the Heinz History Center. 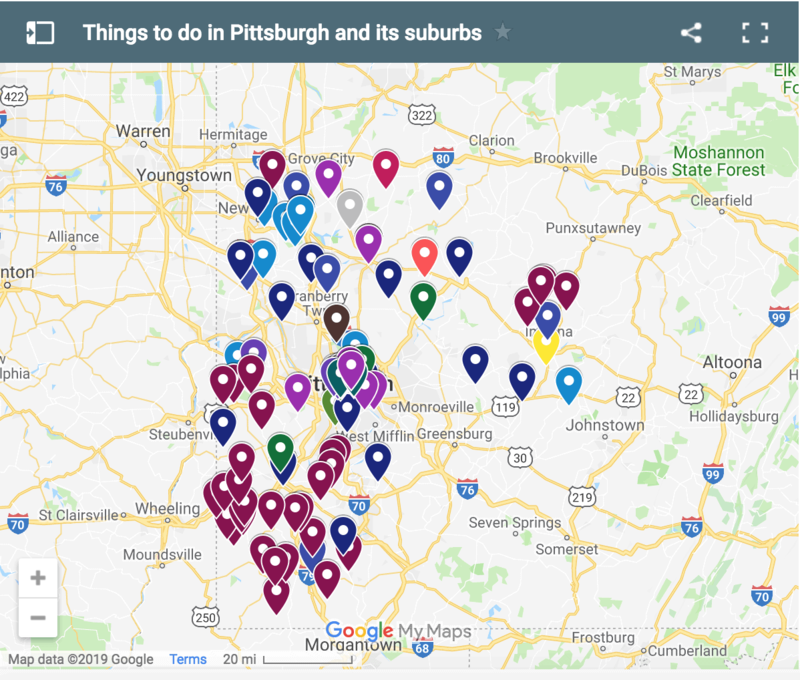 However, both provide plenty of unique information and offer complimentary takes on the history of Pittsburgh and western Pennsylvania. The focus of the Fort Pitt Museum is on the history of The Point, as well as the French and Indian War. 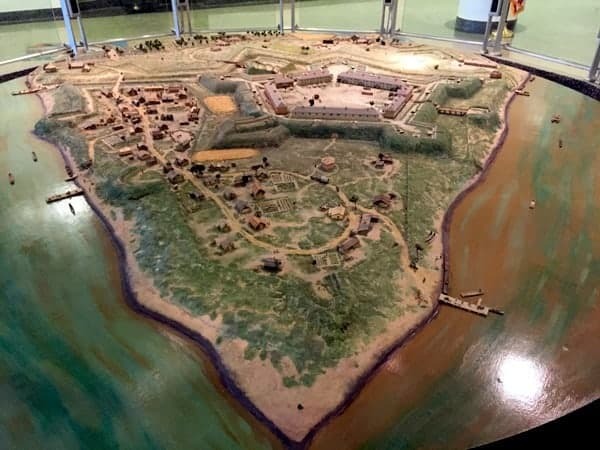 This focus can be seen as soon as you step into the museum, as the first display showcases a model of Fort Pitt as it looked in 1765. This model gives a great overview of the fort and provides a nice point of reference while going through the rest of the museum. 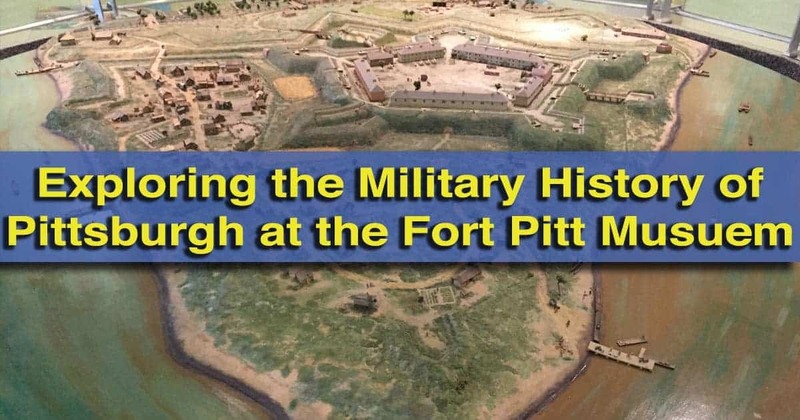 The museum’s model of Fort Pitt offers a great point of reference while visiting the museum. The first floor of this two-story museum focuses on what life was like for the first residents of the Pittsburgh area, both Native Americans and Europeans. Using dioramas, paintings, and hands-on displays, this portion of the museum does a great job teaching visitors of all ages what life in Pittsburgh was like centuries ago for all of the region’s residents. The majority of the museum’s displays are located on the museum’s second floor. Start your visit to this floor with the short video. This museum attempts to answer the question, who does the land belong to? The video is filled with a lot of great information, and I found the way they handled the land rights of Native Americans to be well done. In fact, the museum does a good job handling the history of Native Americans in the region. While they don’t cover much prior to the arrival of the Europeans, the Fort Pitt Museum offers a great overview of the tribes that lived in the area, and how they interacted and were changed by the arrivals of the French and English. The Fort Pitt Museum focuses on the little-known history of 18th-century western PA. The focus on the museum’s second floor is on the importance of The Point and how that small spit of land impacted and controlled the events of western Pennsylvania. The museum uses dioramas and artifacts to tell the story of the French and Indian War, the Revolutionary War, and the experiences of settlers and natives in the region during the 18th century. I really appreciated the in-depth nature of the museum, which showcased not just the better known conflicts, but also little-known events such as Pontiac’s Rebellion and Lord Dunmore’s War. There was also a great section about the many visits that George Washington made to southwestern PA.
As you’re walking through the museum, don’t miss the great view out of the museum’s windows. They provide a fantastic and unique look at Point State Park, the Monongahela River, and the Fort Pitt Bridge. The museum’s windows offer a great view of the Fort Pitt Bridge. 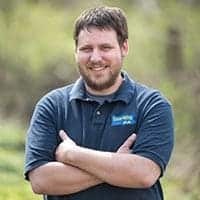 Also worth noting is that, throughout the year, the Fort Pitt Museum offers lectures directly related to the topic of early Pittsburgh history. 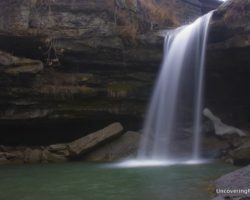 Themes include Native American life, the French and Indian War, and the life of women in western PA in the 18th century. 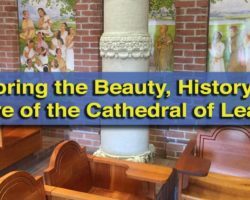 If you are especially interested in these topics, they provide a unique way to learn about these often overlooked aspects of history. There are also Living History days held every Saturday from late May through late August. At these events, visitors can see costumed interpreters and learn about aspects of military life on the 18th-century frontier. 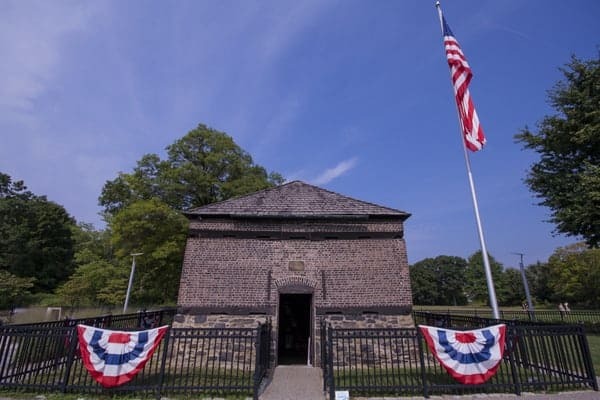 Before leaving Point State Park, make sure to check out the Fort Pitt Blockhouse. Built in 1764, this small building is thought to be the oldest structure in western Pennsylvania. Run separately from the Fort Pitt Museum, entrance to this building is free, whether you’ve visited the museum or not. Inside, there is a gift shop and a small museum. You can also check out the interior of the building and learn a bit about what life was like in the fort. The Fort Pitt Blockhouse is the oldest structure in Pittsburgh. 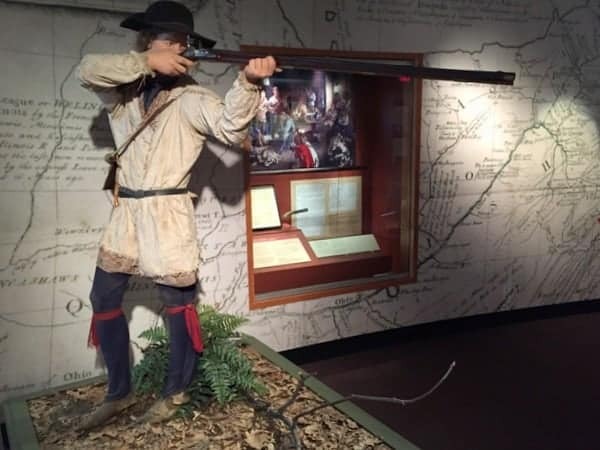 The Fort Pitt Museum is a very well done museum and offers the best opportunity to learn about the French and Indian War in western Pennsylvania, as well as 18th-century life in the Pittsburgh area. If you are looking for a more broad overview of Pittsburgh’s history, the Heinz History Center may be more to your liking, but if you are looking to learn about a little-known period of American history, you won’t want to miss this fantastic museum in Pittsburgh. Note: My visit to the Fort Pitt Museum was hosted by the museum. However, the opinions expressed are my own.